I would like to share with you the use of Business Transaction Event 1110 – CHANGE DOCUMENT: Save the standard data comparing to the FI Validation Rule. Many experts in SAP don´t know about the BTE’s and mainly the BTE 1110 – CHANGE DOCUMENT: Save the standard data. Personally, I prefer this BTE instead of the FI validation rule in some cases because of the Validation Rule is triggered every time you change the FI document and this sometimes are really boring, even if you don´t save or park the finance accounting document. So, this is the first benefit of the BTE 1110: it´s triggered only when you Save or Park the finance document. The other benefit is, on the structure of the function module, you have the old data and the new data (after the change). YBSEG, YBKPF and YBSED keep the original document data while the XBKPF, XBSEG and XBSED has the change and new data of the finance document. There are some validation case, that you should select BKPF or BSEG table to compare old and new data to perform your validation logic. So, the benefit here, you already have both!!! If you need to record and manipulate data in a Z table for example after the validation or substitution rule, when the user are changing the FI document. For example, to log additional change log of the FI document. You cannot use the Validation Rule or Substitution Rule to Commit data in Z tables if you have some need related to this. The main reason, is because the substition rule and validation rule are called everytime when the user is changing the FI document, so you will not know when insert/change and commit the Z data. The benefit to use the BTE 1110 is that it´s called only when the user is saving the FI accounting document. You can access the Finance Accounting BTE’s thru SAP Reference IMG -> Financial Accounting -> Financial Accounting Global Settings -> Business Transaction Events. If you have other experiences with the Business Transaction Event 1110 – CHANGE DOCUMENT: Save the standard data, please share with us in this Blog Post. For me, it was a good replace of the traditional FI validation rule. How about providing the BTE Transactions such as FIBF so people who don’t know about them can go and have a look. I have added the following wiki link BTE – Business Transaction Event which mention some BTE related transaction codes and some debugging tips. 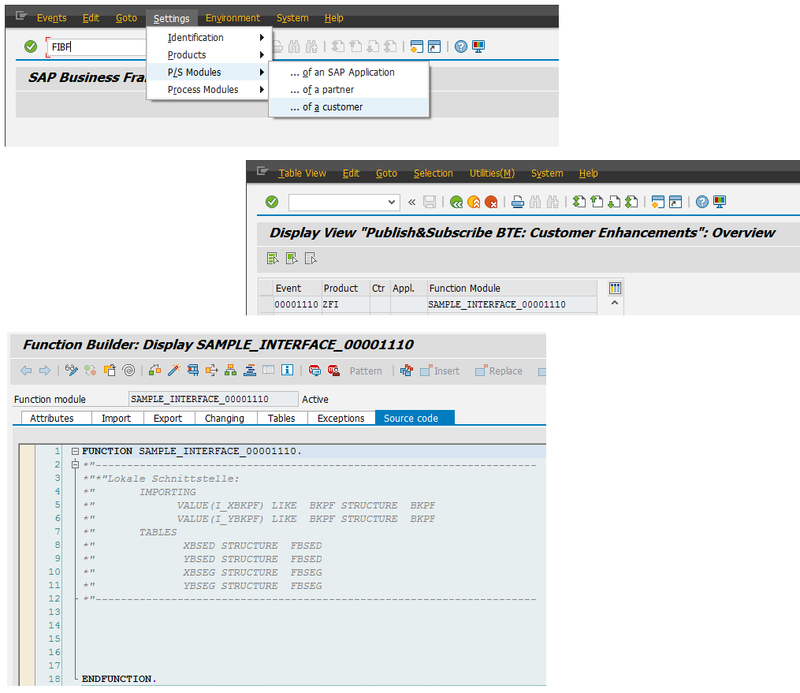 There are another tip that I follow up to discover in the ABAP code the available BTE’s. After that, I proceed with the transaction codes and all BTE’s called in SAP will pass thru these two Functions. So you can find out technically others BTE’s for your use. As you mentioned, the FIBF is the main maintenace transaction to activate specific BTE’s. Valeu Gabriel, gostei do blog! um grande benefício em usar o BTE é a questão de transporte. Regras de Valid/subs tem a questão do transporte bem dificultada pela governança do sistema. Como se sabe só se transporta os passos de uma única vez, e isso aumenta o risco de dar problemas. No BTE não tem isso. Vai no evento de campinas este ano? Fala Marcel, tudo bom ? Obrigado pelo feedback, realmente as BTE’s fazem a diferença. Estive nas duas últimas edição do SIT Campinas, estou esperando o J.Nunes postar a agenda para confimar.